SoftPlanet makes it possible for everyone to get free Axara Audio Converter download directly from our servers. There is no registration needed for downloading. Axara Audio Converter is a multipurpose application, which converts audio files from one format to another. It is free to try and download, and if you like it, you can buy it. 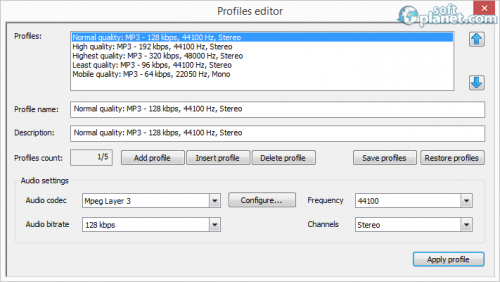 This program can be used to unify your different file audio collection, or to convert your favorite songs to the format you need today. Also, with it you can edit the tracks by splitting, cutting and joining them. Furthermore, you can extract the audio content from any video clip, movie or trailer. So in other words, this is: “Buy one, get two free” kind of a deal. The latest revision has a new GUI interface and conversion core. It can import almost every file format you can think of and can output audio files in MP3, AAC, M4A, WMA, WAV, AIFF, AMR, FLAC and OGG. The system requirements are moderate: 1GHz CPU and 50 MB of free disk space and can be installed on any Windows XP, 2000, Vista, 7 or 8 installation. Seven languages are well supported to contribute to the use of this program in the most efficient way. The interface of this program is very well designed. On top of everything you can change the color theme in Blue, Black, Aqua and Silver. Four menus on the top and one icon toolbar underneath provide all the functionality of this program. At the bottom there are five more buttons to add, delete and download files. For your convenience the developer has implemented a player, so you can preview the songs, before converting them directly from here. The output folder can be chosen with the Browse button on the right. Next to it is Edit Profiles from where each of the available output formats can be explicitly configured, prior to the files conversion. To change the theme you have to click on the Options menu, located in the very right upper corner of the program window and select the desired one. To operate with this convertor first you can add your files, which can be in various formats, using the Files menu or the Add files button. Then from the Formats menu select the desired output format. Use the Edit profiles if you want. Then select the destination folder from the Browse button and finally click the last icon from the toolbar to convert your files. 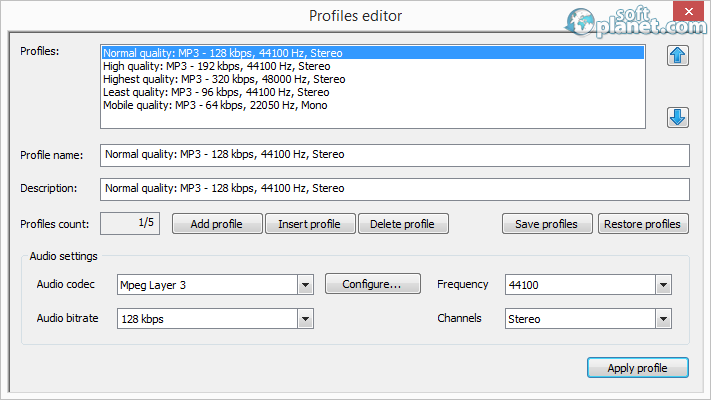 Axara Audio Converter is only one of many audio and video tools designed by Axara. We encourage you to try this product first and if you like it, go for more. The sad news is, that the trial version can only convert 33% of your files. Otherwise, it did all the tests performed by us with ease and the quality of the generated output files were same as the originals, with no doubt. 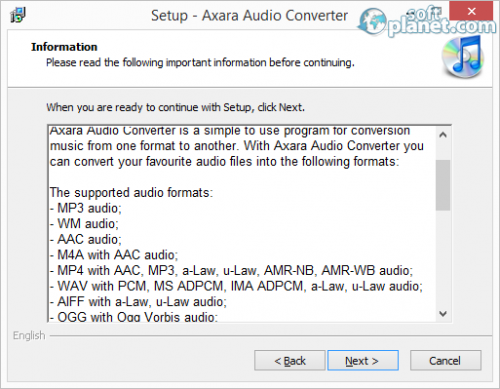 Axara Audio Converter is VIRUS-FREE! 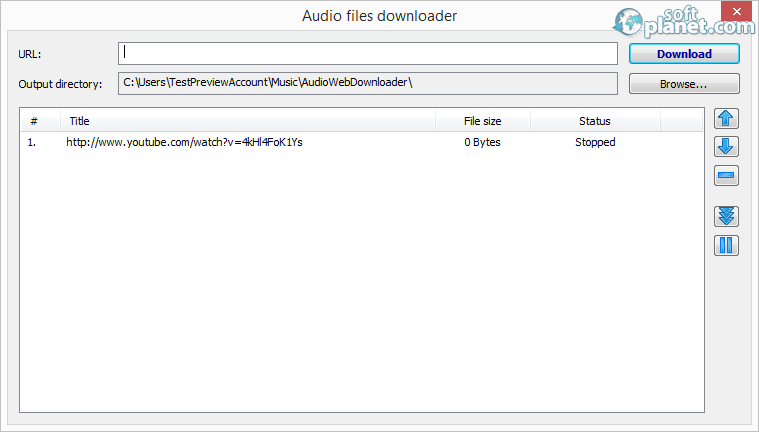 Our security scan shows that Axara Audio Converter is clean from viruses. The current version of Axara Audio Converter has been scanned by our system, which contains 46 different anti-virus algorithms. That ensures that Axara Audio Converter 3.3.2.416 is 100% safe for your computer.